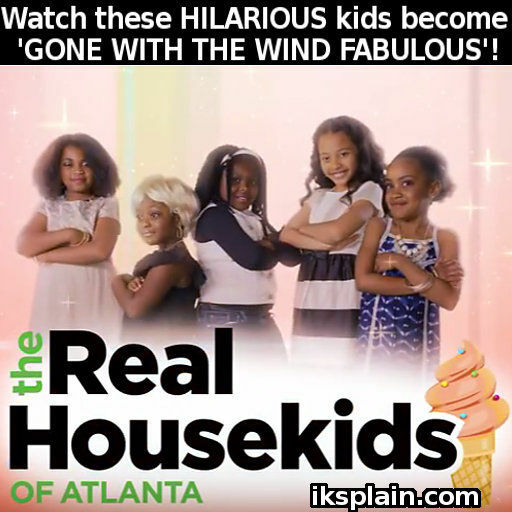 REAL HOUSEWIVES OF ATLANTA Kids Hilarious Video Parody! Real Housewives of Atlanta got an awesome scene makeover by some hilarious kids! The video shows kids acting ‘Gone With The Wind Fabulous‘ and they do NOT hold back! If you love a good mashup like I do, this video will give you life! Watch five very talented kids pour fire into the roles of Nene Leakes, Kenya Moore, Phaedra Parks, Cynthia Baily and Porsha Stewart (Williams). The only sad part is that the children are not in the credits. Fake names are perfectly fine, especially for kids, but they should be there. I just don;t want the producers (Mashable.com) to get ALL the credit. Anyways, congrats to everyone involved! Here’s my own mashup of another Real Housewives of Atlanta scene. In this video I try to do my for season 7, episode 17, when the Atlanta Housewives takeover! The ladies react to Dr. Jeff‘s infamous counseling session where he tried to get Nene Leakes and the other housewives to resolve their issues! . My show was ambushed y’all! Enjoy! Reality TV Curse? Celebrity Tragedy, Foul Play & More!